Globally, floods cause significant human and economic consequences, displace populations, set back development and divert resources from investment priorities. Yet the impact of flood events can be significantly reduced by investments into preparedness planning and decision support tools, including flood forecasting and early warning systems. Flood forecast data can provide the lead-time necessary for a wide variety of decisions and activities to be carried out ahead of the impact occurring, with the aim of mitigating losses. Rainfall and flood forecasting data are widely available at the local level, especially in more developed countries. Provision of near real-time flood maps at national and trans-national scale showing the progression of flood events (and associated impacts) has until now been limited. JBA Consulting’s innovative flood decision support system, Flood Foresight, has been launched to help inform operational flood risk management activities. 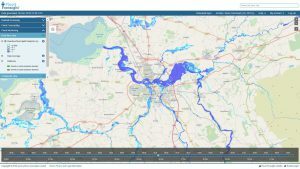 Flood Foresight provides 30-metre resolution maps of current and forecast flood states across the whole of the UK and Ireland, up to 10-days in advance, updated at a frequency of up to three hours. These maps can be merged with asset information to generate rapid impact and loss estimation for current and forecast flood states. “Flood Foresight provides near real-time and forecast rainfall and flood inundation data using state-of-the-art processing of current and forecast river streamflow data. This launch is the culmination of several years’ research and development, building on initial investment in its prototype from InnovateUK” commented John Bevington, Technical Director, Disaster Risk Management. Users of Flood Foresight can benefit from consistent national and trans-national maps of current and forecast flood inundation extents and depths – information that is not readily available in the UK, Ireland or internationally. Near real-time maps are provided every three hours by analysing live readings from streamflow gauges with outputs from JBA’s hydrological models. Daily forecasts of future flood extents and depths are also provided up to 10-days ahead using state of the art flood forecasting systems and rainfall forecasts. Maps are provided across the UK and Ireland at 30m resolution. The system can be configured to run in any country, as evidenced by a demonstration in India. 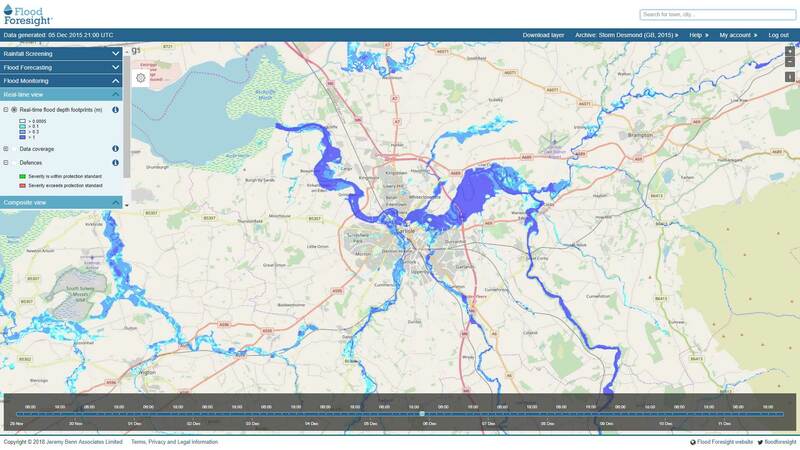 Flood Foresight users can proactively understand, communicate and mitigate flood risk by cross-referencing current and forecast flood maps with their portfolio of asset information. To demonstrate this, Flood Foresight produces free daily flood impact forecasts showing potential impacts from river flooding on road and rail networks and urban centres across England, Scotland and Wales. Users can easily access Flood Foresight data within their own asset management systems or geographic information systems and custom flood alerts can be configured around their own asset datasets. “It is encouraging to see Flood Foresight now being tested, adopted and used in a variety of applications by those who need to make informed decisions when flooding occurs. We’ve produced a flexible tool, which means that in the very near future Flood Foresight will support responses to flood events internationally, as well as in the UK and Ireland. Our expert hydrometeorology and software teams will continue to work with development partners and commercial adopters to demonstrate the benefits of the system in the coming months” commented Marc Pinnell, Managing Director of JBA Consulting. Data produced by Flood Foresight are designed to support decision-making before and during riverine flood events for a range of organisations who need to prioritise, target and manage activities that reduce the impacts of flooding and speed up recovery. The Data-as-a-Service can be integrated with existing business intelligence and decision support tools and Flood Foresight can be used to inform users in a number of sectors, including infrastructure, insurance, utilities and civil contingencies. Consistent, transnational data, with global availability. For more information on Flood Foresight, please email John Bevington or visit our Flood Foresight webpage.